Doug went to the local farmers' market the other day and returned with two pounds of oxtail bones. He purchased them from a local rancher (Shorts Family Farm) who raises grass fed cattle. I've never made oxtail soup before, but I'm game. 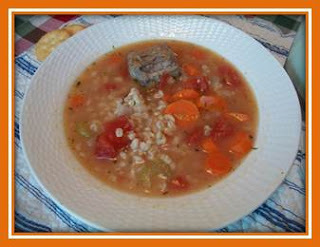 I found a recipe at Cooks.com that looked pretty good - I modified it a little bit to our liking. You should be able to find oxtails at your local butcher shop for about $2/pound. I'm told that years ago it was common to see them in the meat department. 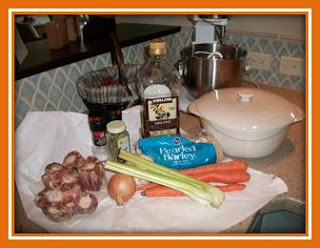 You will need: 2 pounds of oxtails, 2 tbl olive oil, 1cup barley, 2qts water, 3 cloves garlic (minced), 1 large onion (chopped), 2 large carrots (peeled and sliced), 2 celery stalks (thinly sliced), 1 tsp dried parsley, 1 bay leaf, salt, pepper, 1 can chopped tomatoes. 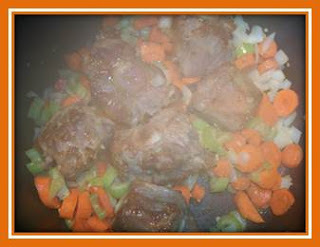 In a large Dutch oven, brown oxtails over a high heat in olive oil; cook just enough to color them. Add onion, garlic, celery and carrots and saute until the onion is soft. Stir in barley, oxtails, bay leaf and tomatoes. Bring to a boil; reduce heat. Cover and simmer for 2 hours. Add salt and pepper to taste. Continue to simmer until the soup has reached the thickness desired and the oxtail meat is falling off the bone. Before serving, skim off any fat from the top of the soup and remove the bay leaf. The soup was very good. I'm glad I added the tomatoes. In the future, I would also add a little bit of chopped stew meat.The oxtail broth had a very complex taste. Great served with a full-bodied red wine and crusty bread.